More than 175 of our extended cousins and spouses served in the American Civil War. Click to see other ways we honor our these cousin-soldiers. The extended Minerd-Minard-Miner-Minor clan played a major role in the Civil War, with 175 known cousins (and spouses, including one "significant other") serving in the military. Two were Confederate. Of the total, more than 18 known soldiers made the ultimate sacrifice of giving his life during the cause, with 20 or more others wounded or injured, and a dozen or more captured as prisoners of war (POWs). Anderson, John B. Husband of Mary E. Bush of Greenfield, IN. Co. B, 8th Indiana Infantry. Alderman, William "Henry." Husband of Mary Jane Miner of Trumbull County, OH. Co. B, 8th Ohio Infantry. Injured near Grafton, WV. Baker, Jonathan. Husband of Hilah (Hall) Hull of Wharton Township, Fayette County, PA. Battery K, 6th Pennsylvania Heavy Artillery. Ball, John. Husband of Barbara Minerd of Cecil, Paulding County, OH. Co. H, 132nd Ohio National Guard Infantry. Beltz, Dr. Daniel E. Son of Lewis Beltz and stepson of Matilda (Comp) Beltz of Buffalo Mills, PA. Co. G, 135th Pennsylvania Infantry. Beltz, William Henry. Son of Lewis Beltz and stepson of Matilda (Comp) Beltz of Buffalo Mills, PA. Co. H, 55th Pennsylvania Infantry. Birch, Samuel A. Husband of Susan A. Miner of Waynesburg, PA. Co. K, 16th Pennsylvania Cavalry. Injured at Bealton Station, VA.
Blythe, Henry. Husband of Isabelle Van Horn of Grand Rapids, OH. Co. B & D, 67th Ohio Infantry. Brellsford, Joshua, a.k.a. "Belford." Son of Brown and Lucinda (Sturtz) Brellsford of Oskaloosa, IA. Co. G, 6th Missouri State Militia Cavalry. Killed in Missouri. Bristol, Lemon W. Husband of Rebecca Ferguson of Constantine, MI. Co. D, 19th Michigan Infantry. Captured as POW at Franklin, TN. Bookman, Samuel. Husband of Sarah Jennings of Ursina, PA. 2nd Battery, Maryland Volunteers and Independent Battery C, Pennsylvania Light Artillery. Boyd, Capt. William. Husband of Sarah Miner of Lewistown, IL. Co. H, 103rd Illinois Infantry. Breniman, Frederick. Husband of Matilda Gaumer of Victor, IA. Co., H, 28th Iowa Infantry. Injured at Winchester, VA.
Brown, James R. Husband of Lydia Ann Miner of Cardington, OH. Co. F, 125th Ohio Infantry. Browning, Oliver. 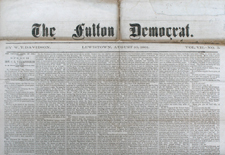 Husband of Mary Elizabeth Gaumer of Coshocton County, OH. Co. F, 51st Ohio Infantry. Captured as POW at Stone's River, TN. Burditt, William J. Husband of Jemima Minerd of Tontogany, OH. Co. B, 123rd Ohio Volunteer Infantry. Wounded in action and captured as POW at Winchester, VA.
Bush, Henry M. Son of Christopher & Elizabeth (Miner) Bush of Greenfield, IN. Co. B, 8th Indiana Infantry. Wounded in action at Vicksburg, MS.
Bush, James. Son of Christopher & Elizabeth (Miner) Bush of Greenfield, IN. Co. B, 8th Indiana Infantry. Bush, John. Son of Christopher & Elizabeth (Miner) Bush of Greenfield, IN. Co. B, 8th Indiana Infantry. Bush, Leroy. Son of Christopher & Elizabeth (Miner) Bush of Greenfield, IN. Co. B, 9th Indiana Cavalry. Died of disease. Bush, Minor. Son of Christopher & Elizabeth (Miner) Bush of Greenfield, IN. Co. I, 6th Indiana Infantry and possibly Co. A, 5th Indiana Cavalry. Comp, Adam Andrew. Son of Jacob and Elizabeth "Betsy" (Sturtz) Comp of Buffalo Mills, PA. Co. C, 82nd Pennsylvania Infantry. Comp, Solomon. Son of Jacob and Elizabeth "Betsy" (Sturtz) Comp of Buffalo Mills, PA. Co. G, 48th Pennsylvania Infantry. Cornwell, Sgt. William. Husband of Eliza (Miner) DeMoss of Van Wert, OH. Co. D, 25th Ohio Infantry. Cross, Heley Patrick. Husband of Mary Ann (Minerd) Crayton of Smithfield, PA. 1st Battalion, 19th United States Infantry & Companies C & A, 2nd Maryland Infantry. Cummings, Dr. Ralph Wardlow Sr. (1832-1880) - Married Eunice "Flora" Miner. Surgeon of the 23rd Michigan Infantry and 1st Colored Heavy Artillery. Custer, Captain Thomas Ward. "Significant other" of Rebecca Minerd of Tontogany, OH. 21st Ohio Infantry. Wounded in battle. Won 2 Medals of Honor. Killed at Battle of Little Big Horn. Dean, James Harvey. Husband of Catherine (Van Horn) Oberdorf. Regiment unknown. Dean, William P. Husband of Catherine (Minerd) Nesmith. Co. D, 37th Pennsylvania Infantry (8th Reserves); Co. H, 1st West Virginia Light Artillery (Independent Battery H). Wounded in battle at Mechanicsville, VA.
DeMoss, Charles W. Husband of Eliza Miner of Van Wert, OH. Co. H, 139th Ohio Infantry and Co. K, 46th Ohio Infantry. Devan, John. Husband of Mary Ann Minerd of Hopwood, PA. Co. K, 85th Pennsylvania Infantry. Dillow, William Baker. Husband of Elizabeth W. (Houser) Baker of Piqua, OH. Co. B, 32nd Ohio Infantry. Enos, Perry. Husband of Joanna Minerd of Normalville, PA. Co. G, 188th Pennsylvania Infantry. Everly, Absalom. Husband of Sarah Jane Carroll of Masontown, WV. Co. C, 3rd West Virginia Infantry, 3rd West Virginia Cavalry and 6th West Virginia Cavalry. Wounded in action at McDowell, WV. Fawcett, Burkett M. Son of Charles B. & Phoebe (Miner) Fawcett of Kingwood, WV. Co. E, 3rd West Virginia Infantry. Killed in action at White Sulphur Springs, WV. Fawcett, Daniel F. (1849- ? ) - son of Charles and Phoebe (Miner) Fawcett of Kingwood, WV. Co. I, 17th West Virginia Infantry. France, John C. Husband of Rhoda Van Horn of Wood County, OH. Co. K, 180th Ohio Infantry. Frank, Cyrus. Son of Jacob and Catharine (Weyand) Frank of Somerset County, PA and Bloomington, IL. Co. B, 112th Pennsylvania Cavalry and Co. I, 145th Illinois Infantry. Frank, Henry J. "Teddy." Son of Jacob and Catharine (Weyand) Frank of Somerset County, PA and Bloomington, IL. Co. A, 39th Pennsylvania Infantry and Co. I, 191st Pennsylvania Infantry. Frank, Jacob C. Son of Jacob and Catharine (Weyand) Frank of Somerset County, PA and Bloomington, IL.Co. B, 39th Illinois Infantry. Drowned in the James River in Virginia. Frank, Michael. Son of Jacob and Catharine (Weyand) Frank of Somerset County, PA and Bloomington, IL. Co. E, 133rd PennsylvaniaInfantry. Frederick, James. Son of George and Rachel (Rohrbach) Friedrich of Lyons, PA. Co. K, 167th Pennsylvania Infantry and Co. E, 57th Pennsylvania Infantry. Gaumer, Allan A. Son of Nathan and Mary Ann (Keck) Gaumer of Allentown, PA. 47th Pennsylvania Infantry. Died/killed in Key West, FL. Gaumer, Sgt. Anthony. Son of Daniel and Hannah (Baughman) Gaumer Sr. Co. F, 26th Ohio Infantry. Died in Chattanooga, TN. Gaumer, Jesse. Son of Charles and Sally (Shoemaker) Gaumer of Somerset County, PA. Co. H, 171st Pennsylvania Drafted Militia. Gaumer, Jesse. Son of Daniel and Hannah (Baughman) Gaumer of Muskingum County, OH. Co. B, 80th Ohio Infantry. Wounded in action at Iuka, MS.
Gaumer, Nathan. Son of Johann Dietrich "Dieder" and Anna Elizabeth (Heinly) Gaumer of Allentown, PA. Co. E, 202nd Pennsylvania Infantry. Gaumer, William "Henry." Co. E, 160th Ohio Volunteer Infantry and Co. D, 191st Ohio Infantry. Gaumer, Willoughby. Son of Nathan and Mary Ann (Keck) Gaumer of Allentown, PA. Co. I, 1st Pennsylvania Cavalry. Died in camp in Allentown, PA.
Geller, George W. Son of John and Lucinda (Comp) Geller of Buffalo Mills, PA. Co. F, 138th Pennsylvania Infantry. Geller, John. Married Lucinda Comp of Buffalo Mills, PA. Co. F, 138th Pennsylvania Infantry. Wounded. Georgia, Sylvester S. Married Laveria Minerd of Pittsburg, KS. 28th Iowa Infantry, Co. E. Captured as POW at Sabine Cross Roads, MS.
Gorsuch, Richard M. Husband of Martha Minerd of Maple Summit, PA. Co K, 1st Potomac Home Brigade, Maryland. Wounded in action at Maryland Heights, MD. Halfpenny, Calvin P. Husband of Caroline Minerd of Fayette County, PA. 18th Pennsylvania Cavalry. Deserted. Hall, David L. Son of Joseph and Elizabeth Hall and stepson of Elizabeth (Rowan) Hall of Wharton Furnace, PA. 14th Pennsylvania Cavalry. Died as a POW. Hall, Henry. Son of Joseph and Elizabeth Hall and stepson of Elizabeth (Rowan) Hall of Wharton Furnace, PA. Co. K, 116th Pennsylvania Infantry. Hall, John K. Husband of Lucinda Minerd of Maple Summit, PA. Co. G, 107th Pennsylvania Infantry. Hanshaw, Dr. Guy R.C.A. Son of Hiram B. and Catherine (Miner) Hanshaw of Independence, WV. Contract surgeon. Wounded in action at New Interest, WV. Hayden, William Buck. Husband of Matilda Langdon of Columbus, OH and New York/Catskill, NY. Commanded a company during Morgan's Raid into Ohio. Harbaugh, David. Son of Leonard and Martha (Minerd) Harbaugh of Scullton, PA. 5th Pennsylvania Heavy Artillery. Heilman, Abiel W. Son of Nathan and Elizabeth (Miner) Heilman of Mauch Chunk (Jim Thorpe), PA. Co. I, 1st Pennsylvania Volunteers & 5th Pennsylvania Militia Infantry. Hess, George H. Husband of Elizabeth Walb of Berks County, PA. Co. H, 167th Pennsylvania Militia. Huggins, Eugene. Husband of Jennie Hanshaw of Independence, WV. Co. D, 4th West Virginia Cavalry. Hull, Jacob. Husband of Hilah Hall of Wharton Township, Fayette County, PA. Co. E, 14th Pennsylvania Cavalry and Co. K, 47th Pennsylvania Infantry. Ingles, Jacob. First husband of Sarah Minerd of Hopwood, PA. Co. B, 101st Pennsylvania Infantry. Also known as "Engles." Jennings, John R. Husband of Martha J. Knight of Somerset County, PA. Co. E, 133rd Pennsylvania Infantry. Johnson, Adrian. Husband of Rebecca Catherine Martin of Independence, Preston County, WV. Co. E, 14th Pennsylvania Cavalry. Drowned in the Jackson River, Covington, VA.
King, Eugenus. Husband of Ida (Gribble) Groves. Co. I, 17th West Virginia Infantry. Knight, Daniel Harry. Son of James and Susanna (Imel) Knight of Somerset Co., PA. 92nd Ohio Volunteer Infantry. Knight, Norman D. Son of James and Susanna (Imel) Knight of Somerset County, PA. 4th West Virginia Volunteer Infantry. Lame, Jeptha. Husband of Minerva Jane "Jennie" Miner of Butler, MO. Co. K, 40th Indiana Infantry. Langdon, Judge Byron William. Son of Jane Ann (Duff) Langdon-Minor and stepson of Daniel Minor Jr. Sergeant Major, 108th Indiana Volunteers. Leonard, Reuben H. Son of Benjamin & Sarah (Harbaugh) Leonard. 168th Pennsylvania Infantry. Lindley, Cyrus. Husband of Elizabeth Miner of near Waynesburg, PA. Co. D, 140th Pennsylvania Infantry. Captured as POW at Peola Mills, MS.
Liston, Jesse. Husband of Susan C. "Sue" McMillan of Listonburg, PA. Co. B and H, 54th Pennsylvania Infantry. Wounded at New Market, VA.
Lydig, William M. Husband of Winifred Agnes "Winnie" Shirer of Adamsville, OH. 142nd Pennsylvania Infantry. Wounded at Hatcher's Run. Mathany, James A. Husband of Eliza Miner of Leavittsburg, OH. Trumbull Guards (Ohio). Martin, James K. Husband of Margaret Minard of near Kingwood, WV. Co. H, 3rd Regiment, Potomac Home Brigade (Maryland). Martin, Presley. Son of Henry and Keziah (Miner) Martin of Preston County, WV. 46th Battalion, Virginia Infantry and 26th Cavalry Regiment Virginia (Confederate). Martin, Sylvester Monroe - Son of Henry and Keziah (Miner) Martin of Preston County, WV. Co. I, 17th West Virginia Infantry. McKnight, Henry. Husband of Barbara Minerd of Wharton Township, PA. Co. E, 140th Pennsylvania Infantry. Meighan, James. Husband of Mary Joanna Heilman of Mauch Chunk (Jim Thorpe), PA. Brown's Independent Company, Pennsylvania Cavalry & Co. A, 202nd Pennsylvania Infantry. Mills, Alexander. Husband of Elizabeth Heilman of Mauch Chunk (Jim Thorpe), PA. 132nd Pennsylvania Infantry. Miner, Albert. Son of Joseph & Elizabeth (Forney) Miner of Champion, OH. Co. C, 19th OH Volunteer Infantry. Captured as POW at Chickamauga, TN; died in prison. Minerd, Alpheus. Son of Samuel & Susanna (Hueston) Minerd of Tontogany, OH. Co. D, 34th Ohio Infantry. Captured as POW at Beverly, WV. Minerd, Andrew. Son of Henry & Hester (Sisler) Minerd of Dunbar Twp., PA. Co. F, 14th Pennsylvania Cavalry. Injured in camp at New Creek, WV. Miner, Andrew Jackson. Son of Frederick & Jane (Richardson) Miner Sr. of Sego, OH. Co. H, 90th Ohio Infantry. Died of disease at Vining Station, GA. Miner, Chance. Son of Henry & Polly (Younkin) Minerd of near Waynesburg, PA. Co. B, 1st West Virginia Cavalry. Minor, Daniel L. Son of Jacob & Mary (Ferguson) Miner of Brownsville, OH. 27th Ohio Infantry & 10th Ohio Cavalry. 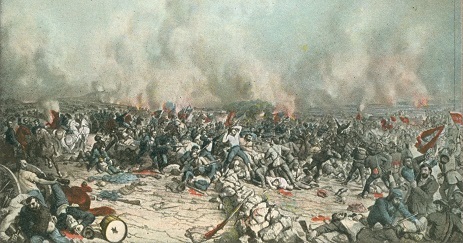 Wounded in action at Resaca, GA. Miner, David Nesbit. Son of Burget & Sarah Ann Minerd of OH. Co. H, 15th Ohio Infantry. Miner, Eli B. Son of Daniel & Margaret (Fluckey) Miner Sr. of Cardington, OH. Co. C, 96th Ohio Infantry. Miner, Ephraim. Son of Henry & Polly (Younkin) Minerd of Kingwood, PA. Co. D., 142nd Pennsylvania Infantry. 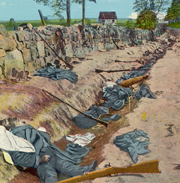 Injured in action at Fredericksburg, VA. Miner, Franklin C. Son of Elias and Mary (Cook) Miner of Mauch Chunk (Jim Thorpe), PA. Co. A, 6th Pennsylvania Volunteer Infantry & Battery H, 2nd Pennsylvania Heavy Artillery (112th Pennsylvania Volunteers). Miner, Frederick Jr. Son of Frederick & Elizabeth (Sechman) Miner of Hebron, OH. Co. A, 10th Ohio Cavalry. Injured in action at Jonesboro, GA. Miner, Henry A. Son of John & Sarah (Ansell) Minerd of Kingwood, PA. Co. K, 171st Pennsylvania Drafted Militia. Miner, Capt. Henry Clay. Son of Daniel & Margaret (Fluckey) Miner Sr. of Cardington, OH. 15th Ohio Infantry & 3rd Ohio Cavalry. Minerd, Henry C. Son of Jacob and Ruth (Adams) Minerd Sr. of Philippi, WV. Co. E, 17th West Virginia Infantry. Minerd, Isaac F. Son of James & Sarah (Walters) Minerd Sr. of Wharton Furnace, PA. Co. I, 85th Pennsylvania Infantry. Minerd, James Jr. Son of James & Sarah (Walters) Minerd Sr. of Wharton Furnace, PA. Co. I, 85th Pennsylvania Infantry. Wounded in action at Strawberry Plains/Deep Bottom, VA.
Minard, Jeremiah (1841- ? ) - Son of Burket and Susan (Hartzell) Minerd of Kingwood, WV. Served in the 33rd Infantry Regiment Virginia, Co. F (Confederate) and later was arrested as a spy. Captured as POW at New Creek, WV. Miner, John. Son of Frederick and Elizabeth Miner III of Mauch Chunk, PA. Co. A, 132nd Pennsylvania Infantry. Removed from the regiment in order to make shells in the family's iron business. Minerd, John. Son of Jacob and Ruth (Adams) Minerd Sr. of Philippi, WV. Co. E, 17th West Virginia Infantry. Minerd, John Vernon Smith. Son of Henry & Hester (Sisler) Minerd of Dunbar Twp, PA. 5th Independent Battery, Ohio Light Artillery. Miner, Joseph. Son of Jacob and Julianna (Forney) Minor of New Waterford, OH. 52nd Ohio Infantry, Co. A. Miner, Levi. Son of Frederick and Elizabeth Miner III. Co. H, 11th Pennsylvania Infantry. Wounded at Bull Run. Miner, Martin. Son of John & Sarah (Ansell) Minerd of Kingwood, PA. Co. C, 142nd Pennsylvania Infantry. Minard, Nathan W. Son of Solomon & Rachel (Little) Minard Sr. of Mt. Vernon, OH. Co. B. 96th Ohio Infantry. Miner, Robert Sanford (1840-1918) - Son of Henry and Matilda (Morton) Miner of Fountain County, IN. Co. G, 10th Indiana Infantry. Miner, Samuel. Son of Joseph & Elizabeth (Forney) Miner of Champion, OH. Co. C, 19th Ohio Infantry. Captured as POW at Big Shanty/ Kennesaw Mountain, GA. Miner, Samuel Dawson (1837-1906) - Son of Henry and Matilda (Morton) Miner of Fountain County, IN. Co. A, 88th Ohio Infantry and Co. A, 9th Ohio Cavalry. Minard, Thomas G. Son of Solomon & Rachel (Little) Minard Sr. of Mt. Vernon, OH. Co. F, 142nd Ohio National Guard. Miner, Thomas Irvin. Son of Levi and Catherine (Kiefer) Miner of Mauch Chunk (Jim Thorpe), PA. Co. H, 11th Pennsylvania Infantry & Co. H, 201st Pennsylvania Infantry. Miner, Thomas M. Son of Frederick & Jane (Richardson) Miner Sr. of Sego, OH. Co. H, 90th Ohio Infantry. Captured as POW at Stone's River/ Murfreesboro, TN. Minerd, Uriah. Son of John and Barbara (Shaeffer) Minerd of Monroeville, IN. Co. G, 20th Ohio Volunteer Infantry and Co. B, 201st Ohio Volunteer Infantry. Minerd, William. Son of James & Sarah (Walters) Minerd Sr. of Wharton Furnace, PA. Co. I, 85th Pennsylvania Infantry. Wounded in camp at Bermuda Hundred, VA. Miner, William. Son of George & Susannah (Smith) Minard of New Rumley, OH. Co. G, 74th Ohio Infantry. Minerd, William. Son of Jacob and Ruth (Adams) Minerd Sr. of Philippi, WV. Co. E, 17th West Virginia Infantry. Miner, William H. Son of Elias and Mary (Cook) Miner of Mauch Chunk (Jim Thorpe), PA. Co. F, 132nd Pennsylvania Infantry. Moffitt, Dillon W. Son of John and Druzella (Welker) Moffitt of Edgar County, IL. Co. F, 54th Illinois Volunteer Infantry. Died en route home from Vicksburg. Moore, Isaac. Husband of Rebecca "Catherine" (Martin) Johnson of Dunbar, PA. Co. D, 3rd West Virginia Infantry and Co. D, 6th West Virginia Cavalry. Moss, Aaron. Husband of Margaret Sturtz of Muskingum County, OH. 21st Iowa Infantry, Co. A.
Murdock, Godfrey Guseman. Son of John S. & Rebecca (Minerd) Murdock of Kingwood, WV. Co. B, Independent Exempt West Virginia Volunteer Infantry. Murdock, Israel B. Son of John S. & Rebecca (Minerd) Murdock of Kingwood, WV. Co. B, 2nd West Virginia Cavalry. Murdock, Capt. James Eyster Sr. Son of John S. & Rebecca (Miner) Murdock of Kingwood, WV. Captain, Co. A, 7th West Virginia Infantry. Wounded four times: at Fredericksburg, VA; Cold Harbor, VA; Gettysburg, PA; and Williamsburg, VA.
Murdock, Capt. Thomas I. Son of Son of John S. & Rebecca (Miner) Murdock of Kingwood, WV. Captain, Co. A, 7th West Virginia Infantry. Nesmith, Jordan M. Husband of Catherine Minerd of Kingwood, WV & Fayette County, PA. 8th Pennsylvania Reserve Infantry, Co. G, a.k.a. 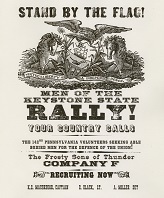 37th Pennsylvania Volunteers. Ogle, William D. Second husband of Sarah (Minerd) Ingles-Ogle. Co. F, 76th Ohio Infantry. Parish, David C. Husband of Edith Moffitt of Edgar County, IL. Co. F, 59th Illinois Volunteer Infantry. Died from wounds at Nashville, TN. Pilgert, Willoughby. Son of George and Christina (Fegely) Pilgert of Berks County, PA. Co. H, 167th Pennsylvania Infantry. Potter, George Perry. Husband of Mary Leonard of Ohiopyle, PA. Co. D, 199th Pennsylvania Infantry and Co. H, 97th Pennsylvania Infantry. Prutzman, Abner. Husband of Sarah Meinder of Berks County, PA. Co. M, 5th United States Artillery. Purinton, Thomas L. Husband of Matilda "Tillie" Hanshaw of Independence, WV. 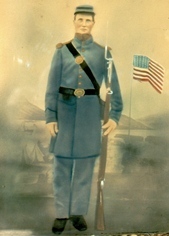 Co. F, 6th West Virginia Infantry. Pyles, Daniel Mitchel (1845-1922) - Married Sarah Miller of Preston County, WV. 6th West Virginia Infantry. Rankin, Robert. Husband of Hester Ann Minerd of Farmington, PA. Battery K, 2nd Pennsylvania Artillery. Wounded in action at Petersburg, VA.
Ream, Chauncey Forward. Son of James A. and Eleanor (Colborn) Ream. Companies C and K, 2nd Iowa Infantry. Reynolds, George W. Second husband of Minerva Jane "Jennie" (Miner) Lame. 40th Indiana Infantry. Rockwell, John Freeman. Husband of Alice Minerd of Hopwood, PA. Co. F, 40th Pennsylvania Infantry (11th Pennsylvania Reserve). Rose, Andrew Jackson. Husband of Susanna Minerd of Kingwood, PA. 142nd Pennsylvania Infantry. Wounded in action at Gettysburg, PA.
Rose, Charles. Husband of Catherine Minerd of Kingwood, PA. Co. K, 171st Pennsylvania Drafted Militia. Rose, Gilman. Husband of Barbara Ellen Minard. Co. D, 113th Ohio Infantry. Rowan, David J. Son of James and Catherine (Harbaugh) Rowan of Ohiopyle, PA. Co. F, 14th Pennsylvania Cavalry. Rowan, James. Husband of Catherine Harbaugh of Ohiopyle, PA. Co. K, 85th Pennsylvania Infantry. Rowan, Jonas. Son of James and Catherine (Harbaugh) Rowan of Ohiopyle, PA. Co. F, 14th Pennsylvania Cavalry. Rowan, Josiah. Son of James and Catherine (Harbaugh) Rowan of Ohiopyle, PA. 5th Pennsylvania Volunteer Infantry. Rowan, Leonard. Son of James and Catherine (Harbaugh) Rowan of Ohiopyle, PA. Co. K, 85th Pennsylvania Volunteer Infantry. Died of disease. Shaulis, Simon. Married Martha "Mattie" Weyand of Ursina, PA & Waterloo, IA. Co. C, 142nd Pennsylvania Infantry and 144th Veterans Reserve Corps. Shepard, William H. Married Sarah Minerd of Tontogany, OH. Co. D, 34th Ohio Infantry. Captured as POW at Beverly, WV. Shipley, Squire. Husband of Dianna Nicklow of Uniontown, PA. Co. D, 101st Pennsylvania Infantry. Smale, Samuel. Husband of Margaret Minard. Co. A, 96th Ohio Infantry and 77th Ohio Infantry. Strauch, John H. Married Mary "Hester" McKnight of Dawson, PA. Co. E, 155th Pennsylvania Infantry. Sturtz, Adam. Son of Jacob and Susanna (Gaumer) Sturtz of Adamsville, OH. Co. I, 69th Ohio Infantry. Sturtz, Adam. Son of Solomon and Elizabeth (Troutman) Sturtz of Greene, IA. 32nd Iowa Infantry. Died May 22, 1864 at Pleasant Hill, LA. Sturtz, Calvin R. Son of Adam and Jane (Wiggins) Gaumer of Dresden, OH. Co. I, 69th Ohio Infantry. Sturtz, Dennis G. Married Malinda Catherine (Gaumer) Sturtz. Co. F, 78th Ohio Infantry. Sturtz, John J. Son of Solomon and Elizabeth (Troutman) Sturtz of Greene, IA. 21st Iowa Infantry. Sturtz, Michael. Son of Solomon and Elizabeth (Troutman) Sturtz of Greene, IA. 32nd Iowa Infantry. Died of disease at Little Rock, AR. Sturtz, Solomon. Son of Solomon and Elizabeth (Troutman) Sturtz of Greene, IA. Co. G, 32nd Iowa Infantry. Died of disease at Vicksburg, MS.
Sturtz, Valentine. Son of Jacob and Lydia (Leydig) Sturtz of Salem and Adamsville, OH. Co. H, 160th Ohio Infantry. Turner, George Washington. Married Mary Frances White of Fayette County, PA. Co. E, 16th Pennsylvania Cavalry. Van Horn, Andrew. Son of Samuel & Sophia (Minard) Van Horn of Grand Rapids, OH. Co. C, 74th Indiana Infantry. Captured as POW. Van Horn, Austin Coleman. Son of Samuel & Sophia (Minard) Van Horn of Grand Rapids, OH. Co. F, 86th Ohio Volunteer Infantry. Van Horn, Eli. Son of Samuel & Sophia (Minard) Van Horn of Grand Rapids, OH. 144th Ohio Infantry. Wounded in action at Monocacy Junction, MD. Van Horn, Isaac. Son of Samuel & Sophia (Minard) Van Horn of Grand Rapids, OH. Co. I, 144th Ohio Infantry. Captured as POW at Berryville, VA.
Welker, Col. Martin. Son of John and Elizabeth (Gaumer) Welker Sr. Aid-de-camp to Governor Dennison and assistant adjutant general with Governor David Tod. Co. I, 188th Ohio Infantry. Weller, William "Frederick." Husband of Mary Coleman of Somerset, PA. Co. C, 52nd Pennsylvania Infantry. White, John Irving. Son of Perry G. White & stepson of Mariah Minerd of Hopwood, PA. Co E, 85th Pennsylvania Infantry. Mortally wounded in action at Fort Wagner, SC. White, Joseph B. Son of Perry G. White & stepson of Mariah Minerd of Hopwood, PA. 2nd Pennsylvania Heavy Artillery; 16th United States Infantry & 2nd United States Infantry. White, Thomas J. Son of Perry G. White & stepson of Mariah Minerd of Hopwood, PA. Co. G, 33rd Iowa Volunteer Infantry and Co. G, 34th Iowa Infantry. Wilkins, John. Son of William and Louisa Ann (Ream) Wilkins of Fort Hill, PA, and husband of Rachel (Phillippi) Gerhard Younkin, widow of Josiah Younkin. Regiment unknown. Wintermute, Franklin Charles. Husband of Katherine Salkeld Miner of Mauch Chunk (Jim Thorpe), PA. Co. F, 132nd Pennsylvania Infantry. Woods, George T. Husband of Catherine Ream of Ursina, PA and Dakota City, NE. Co. I, 2nd Nebraska Cavalry. Wydman, William H. Husband of Lucy Minor of Columbus, OH & Rush County, IN. Co. D, Benton Cadets and Co. E, 11th Ohio Infantry. Wymer, Alfred. Son of John and Rebecca (Gaumer) Wymer of Adamsville, OH. 15th Ohio Infantry and 78th Ohio Infantry. Wymer, Daniel. Son of John and Rebecca (Gaumer) Wymer of Adamsville, OH. Co. B, 159th Ohio Infantry (Ohio National Guard). Younkin, Jacob M. Son of John M. & Laura (Minerd) Younkin of Kingwood, PA. Co B, 85th Pennsylvania Infantry. Killed in action at Seven Pines/ Fair Oaks, VA.
Younkin, Silas. Married Zobeidi Jane "Betty" (Ream) Colborn of Confluence, PA. 133rd Pennsylvania Infantry. Wounded at Chancellorsville, VA.